This hand wash blends the antioxidant qualities of wild harvested seaweed with aromatic lemon aromas. A perfect balance between the green and the blue halves of our planet. 100% natural fragrance, with essential oils. Free from parabens and SLS. 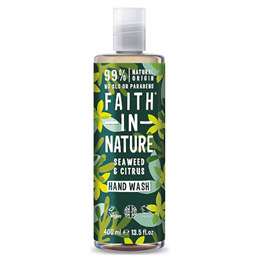 Below are reviews of Faith in Nature Seaweed & Citrus Hand Wash - 300ml by bodykind customers. If you have tried this product we'd love to hear what you think so please leave a review. I'm fussy when it comes to hand washes but I like this one as it is made with natural fragrances and the scent is mild yet pleasantly refreshing. The dispenser is good and strong, releasing the liquid soap more easily than some other brands I've used before. Great hand wash, i like natural products.